Not long after I took a job with GE's financing arm a little over a decade ago, I suggested to one of the people who researched new markets to get into that they look at the comic book community. There was this large segment of people with disposable income and, if you could tie it through perhaps Diamond somehow, you'd have a built-in network of a couple thousand locations to promote it off the bat. At the time, it didn't go over. Keep in mind that this was A) before Disney bought Marvel, B) before the first Iron Man movie came out, and C) shortly before the housing market tanked. Comic-Con had only just started seeing attendance top 100,000. So it was a totally different set of circumstances than last year, when Synchrony Bank launched a Marvel specific credit card. Marvel and their characters have become much more of household names, thanks in large part to their movie successes, and that has in turn helped propel "geekdom" into a more mainstream and acceptable venue. (To be clear, Marvel is by far NOT the sole instigator of this trend!) So a Marvel-themed credit card is certainly a lot more viable now than it was a decade ago. That said, what I find interesting is that the Marvel card benefits extend substantially beyond comics. The main value proposition from their website is: "EARN 3% CASHBACK on dining, select entertainment, online at Marvel.com and Marvel's official merchandise booths, paid as a statement credit." So if you buy $100 worth of stuff at Marvel.com using your Marvel card, they'll credit you $3.00 back to your account. I think people get that pretty easily, but what's a little harder to sift through is that it's set up more broadly as an entertainment card. So you get that same 3% credit if you use the card at a movie theater. Which makes sense since, as noted above, Marvel owes a lot of thanks to its film successes. But it also applies to amusement parks (kind of makes sense since Marvel is owned by Disney), book stores (duh), video game stores (both Marvel and Disney IPs show up in games a lot), and "digital entertainment" (i.e. comiXology). But then it's also good for music and dining. And none of the categories are really restricted in terms of making your purchases are comic or Marvel related. (I believe that's largely due to the practicality of confirming purchases. It's one thing to check the merchant category code any given business signed up under, it's another to check the SKU of each and every item purchased!) 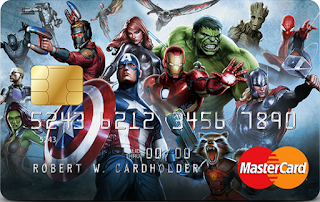 So what you've got is credit card tailored for broad use in people's entertainment, and it happens to bear imagery from Marvel's cache of characters. And from what I've been able to tell, it's working. I didn't think to write down all the specific numbers, but I saw a presentation recently that noted that the majority of card use has been towards dining with movies ranking pretty highly as well. People are using the card for books and in the "toys and hobbies" sector, to be sure, but those are vastly in the minority. It's being used as an entertainment card. The hook, though, isn't so much that you get a 3% credit on some purchases -- the hook is that you get to pull out a credit card with Spider-Man (or whomever) on it. When you pull your card out, you're presenting it as an avatar of your entire lifestyle -- that you're a fan of Marvel, sure, but that you're more broadly a part of popular culture. The 3% is a way to entice you to use the card a couple of times, until you start seeing people's reactions and get a bit of pleasure from their "Ooo"s and "Ahh"s.
Marvel isn't the first company to do this, of course; the AmEx Black Card was designed in much the same manner, as was the Disney Visa card. You used that to show off a certain status. But it's fascinating for me to see how much things have changed in the decade since I first proposed an idea similar to this.